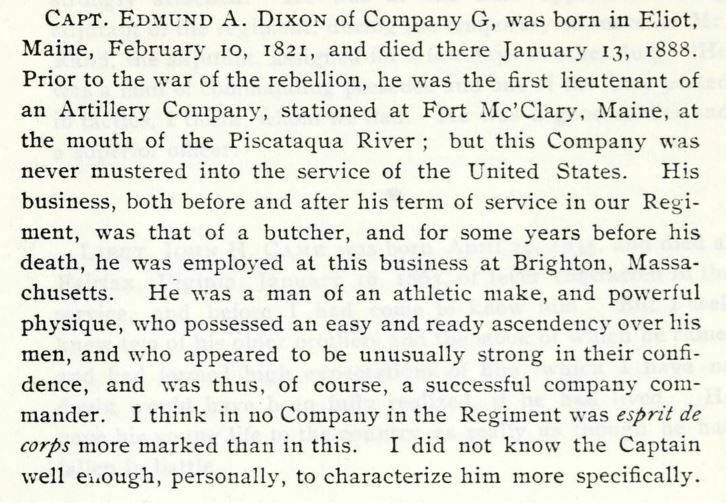 EDMUND A DIXON, the son of Samuel and Sally (Staples) Dixon, was born in Eliot, Maine on 10 Feb 1821 [Old Kittery, pg 358]. He died there on 13 Jan 1888, aged 66 yrs, 11 mos, 13 das [grave; Lewiston Evening Jrnl, 1/20/1888, pg 4]. He is buried in Mt Pleasant Cemetery, Eliot. He was married on 2 Mar 1845 [Old Kittery, pg 358; intents filed 2/9/45 in Eliot] to ANN PARRY PAUL, the daughter of Nathaniel and Lydia P (Kennard) Paul. She was born in Eliot on 19 Oct 1823 [Old Kittery, pg 647], and died in Taunton, MA on 26 Oct 1876, aged 53 yrs, 8 das, from paralysis [death rec]. She was buried in Mt Pleasant Cemetery, Eliot. 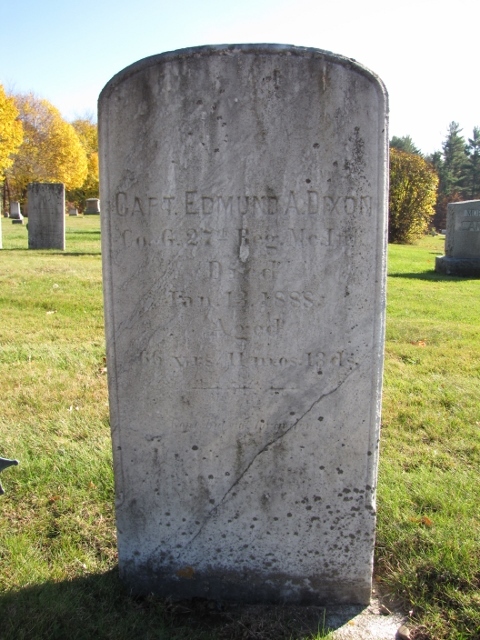 ​Edmund lived early on in his native Eliot, where he ran a butcher shop, and moved to Kittery by 1849. During the 1850's, he had contracts with the Portsmouth Shipyard for the delivery of fresh beef and vegetables. When the war broke out, Edmund was serving as a lieutenant in the Kittery Artillery, a company of Maine militia led by Mark Wentworth (later colonel of the 27th ME), and were assigned to Fort McClary. He returned to Eliot by 1862, and was chosen by the town to raise the troops needed for nine months men. He was subsequently elected captain for the company of those men who volunteered from Kittery and Eliot. Following the war, he removed to Brighton, Mass, where he continued his butcher business. He afterwards went on to Taunton, MA, but returned to Eliot between 1878-1880, and lived with his brother Oliver on the family homestead. This was only for a brief time, as he gave up the butcher work and moved to Cambridge, MA in 1881, and stayed with his daughter Ellen and her husband Amos Wells. By 1886, he had left there and returned to Eliot, where he died. i. ANNETTE CORDELIA DIXON, born in Eliot on 3 May 1845; d. 27 Feb 1924 in Denver, CO. She married, in Brighton, MA on 24 Apr 1865, to DAVID J STEWART. He was born in Prince Edward Isle, the son of James and Christiana Stewart. They moved to Paterson, New Jersey by 1870, and later went to Denver, Colorado. David was a blacksmith. i. Gertrude A, b. Jul 1884; ii. Charles F Jr, b. Aug 1886; iii. Margaret A, b. Dec 1892; iv. Clara Louise, b. Nov 1898; v. Dorothy H, b. ca 1904 (age 6 in 1910). ii. ELLEN JOSEPHINE DIXON, b. in Eliot; d. 25 Jan 1893 in Cambridge, MA from Bright's Disease [death rec]. She married, on 27 Jul 1867 in West Roxbury [MA marr rec], to AMOS BURNHAM WELLS. The son of Amos B and Elizabeth (Buckman) Wells, he was born in Charlestown (or Malden) on 1 Sept 1846, and died in Cambridge on 20 Feb 1911 [death rec]. He worked as a teamster, and lived in Cambridge. He is buried in Cambridge Cemetery. He would remarry, and adopt a girl, but he and Ellen had no children. iii. CLARA J DIXON, b. in Eliot; died 18 Jul 1877 in Newton, MA from dropsy [death rec]. Marr 3 Dec 1868 in Brighton, MA [marr rec] to EDWIN CHAPIN HANSCOM. He was born in Eliot in Jan 1846 [1900 census], the son of Stephen and Olive Hanscom. He died in Newton in 1921 [MA Death Index; grave]. Both are buried in the Hanscom plot in Mt Pleasant Cemetery, Eliot. 1. Clarence Edwin Hanscom, b. Cambridge, MA on 2 Jun 1869 [birth rec]; d. 9 May 1945. Marr Sarah Maria Moseley, dau of Herbert E and Sarah (Smith) Moseley, on 25 Jan 1894 in Newton, MA [marr rec]. They were living in Brookline, MA during 1900 and 1910 censuses, w/ no children. 1. Elmer E Decoff, b. 29 June 1875 in Taunton [birth rec]; d. from cholera infantum on 13 Aug 1875 [death rec]. 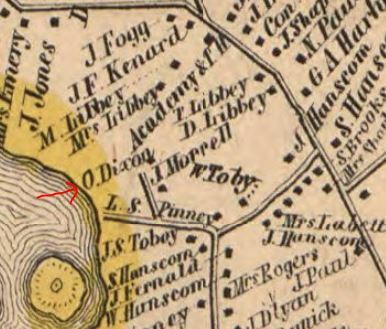 From the "History of the 27th Maine"
Above, on right, is from an 1856 map of Eliot, showing the location of Oliver Dixon's home. He and Edmund received this property in 1848, according to their father's will. I have yet to look up the deed, but I am guessing that Edmund sold off his share to his brother, as he had another place on Farmer Rd (according to a 1963 newspaper inquiry). The old homestead, formerly "off Mast Cove Road", would have been on what is now called Adlington Road, but it had been torn down prior to 1963.